If you’re ever in Calicut and enjoy the sky, waves and sand, then Kadalas Cafe is perfect for you! Serving different cuisines with a view of the sea, be sure to check out this spot for their ambience. In Malayalam, ‘Kadalas’ translates to paper. The owner used this to create a story around the cafe using themes of sand, waves and sky much like different chapters in a book. This reflects in the three-storied building that sketches a different picture on every floor. The ground floor plays with the theme of sand since it’s set on the beach. Their huge windows and french doors that open up to the windy coastline will make you fall in love with Kozhikode. 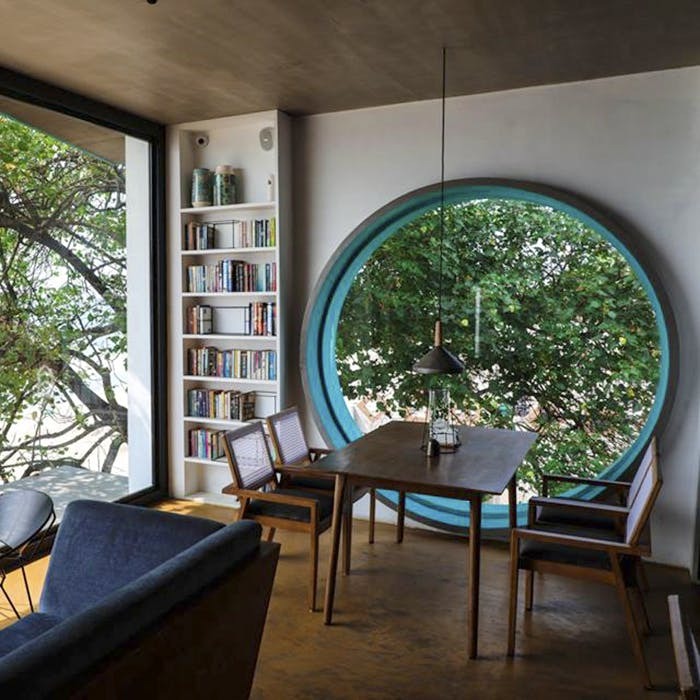 The first floor is based on waves, consisting of a huge round window that overlooks just the sea filling the room with a warm blue colour. Minimalistic furniture and low lying lamps create a romantic ambience (if you’re ever travelling with a significant other, we suggest heading to the waves section of the cafe). Our favourite part about Kadalas is the roof that opens up to the sky, lovingly in tune with the last theme. The setting is casual and great for an evening out with friends since it looks out to the sea and adds a flavour of fun with bean bags for comfort seating (and long naps while you bask in the sun). Serving a variety of cuisines like Italian, Lebanese and Spanish fare, the cafe is great for your fussy friends who like an assortment of choices. We love their creative ideas and that an average meal for two costs INR 600. If you don’t know what to order, try some of their signature dishes that have been curated under a list called ‘Kadalas Crafted’.